With the bank holiday weekend coming, there are bound to be lots of parties and get togethers, and Mountain High pre-rolled cones are ideal for these occasions. Measuring 109mm long and pre shaped into perfect cones, the Mountain High Black Label cones are a great accessory for those busy social events. Made from the finest quality smoking paper, and containing a pre-installed roach these cones are incredibly easy to use. Simply, choose your favourite tobacco or herbal mix, pack it into the cone and you’re ready for a smoke. The cones come in a pack of 64 so you’ll have plenty to get on with; you can even make a batch before you go out so you don’t have to make them when you’re out, result! At just £7.99 per 64 pack these cones are great value; why not check out the whole range which includes various sizes up to the colossal Giga Size Cone measuring an impressive 280mm long. Mountain High Cones are a great accessory to have if you’re not that good at rolling your own cones or need to save time. These kingsize cones come pre-made so all you have to do is fill it up with your favourite herbal blends and light, making them great for parties and going out on the town. Mountain High Black Label Cones are made from the highest quality paper and come complete with roaches and are the ultimate time saver; they are 109mm long and each pack contains 64 pre-rolled cones. Mountain High Black Label Cones are available now for just £7.99 per pack of 64; why not check out the whole range here with sizes ranging from regular to the gargantuan Giga size cone measuring an impressive 280mm long. High Mountain has been producing high quality smoking papers for many years, and keeps the tradition going with its pre-rolled Mountain High Cones. 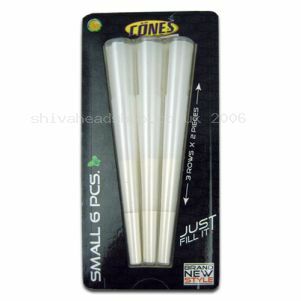 This pack contains 32 perfectly rolled cones that are ideal for parties and social gatherings. These pre-rolled cones come complete with filters, so all you have to do is choose your favourite herbal bends pack it in tight and light, easy! Your friends will be green with envy on how perfect your roll ups are and if you don’t tell them your secret they’ll worship you like a rolling god. Mountain High Cones are approximately 140mm long and are available now for £5.49 per pack. Why not check out the whole range of Mountain High Cones available in various sizes from 100m to 280mm. Mountain High pre-rolled cones are great for those people who are new to rolling or just want to save time, and with the Mountain High Cone Black Label Party Size 32 Pack there is enough for everyone! Made with the finest quality smoking paper, these pre-rolled cones are super easy to make with your favourite herbal mixtures and will have your friends drooling over how good they look. Each cone includes a roach and is 140mm long, making them ideal for parties and social get-togethers. A box of 32 cones cost just £5.49, so what are you waiting for? Mountain High Cones – great for parties! It can take a bit of time to get used to rolling your own cigarettes and you know what they say ‘practice makes perfect’, but for those of you that are just starting out or don’t have the time to roll your own then Mountain High Cones are just for you! These perfectly pre-rolled cones are great for a cheeky smoke and all you have to do is fill them with your favourite herbal mixtures and smoke, easy! Mountain High Cones also have a built in filter so you don’t even have to add your own. Mountain High Cones are available in a range of different sizes including regular, medium and large, as well as the Mountain High Giga Size Cone, a huge 28cm long cone perfect for parties. Available singly or in packs of 3,6 or 12 the Mountain High Cones are perfect for any smoking enthusiast. JWare Kingsize Cones come pre-rolled! Are you tired of having to roll your own cones? Then threat not because JWare’s range of pre-rolled smoking cones are a great time saving accessory for any smoking enthusiast. Available in 3 sizes, kingsize, supersize and Mega size, these pre-rolled cones are ready to fill with your favourite herbal blends. 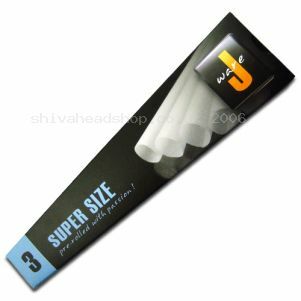 You and your friends will be impressed with the JWare Mega Size Cones as they drawf standard cigarettes with their 28cm length, making it easy to build a huge smoke that will last for hours! JWare pre-rolled smoking cones are a great accessory for the avid herb smoker and will save you time meaning you get to savour the great herbal taste even quicker. 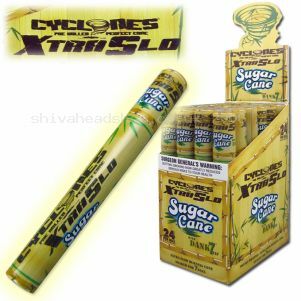 Cyclone Blunts Xtra Slo – try something new today! Fancy trying something different when smoking your favourite smoking mixture? Then why not try Cyclone Blunts. These pre-rolled blunt cones and specially designed to give you a smooth smoke and are slow burning so you can favour the taste for longer. Made from the finest tobacco leaves, Cyclone Xtra Slo Blunts come with bamboo tips that have been soaked in sugar cane or wonderberry flavours for seven days adding a great taste to your smoking experience. Each Cyclone Blunt comes in a tough plastic tube that can be used to store the blunt after it has been rolled. Cyclone Blunts are available now for £1 each, so why not try something new today?